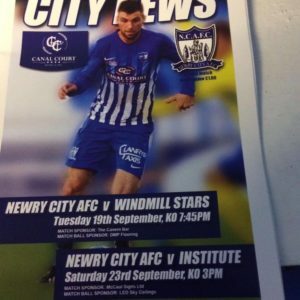 Newry City Reserves welcomed Dungannon Swifts second string to the Showgrounds on Wednesday night. Having picked up a valuable away point on the road the previous week at Ballymena, Newry hoped to secure further points ahead of a really tough run of fixtures over the festive period. The game got off to an unbelievable start with three goals in the first four minutes to put Newry 2- 1 ahead. A brace from Keith Johnston either side of a Marcio Soares strike for the visitors saw Newry race into an early lead. However they were quickly pegged back when Daniel Hughes equalised from a free-kick on the edge of the area in the tenth minute. It went downhill spectacularly after that with a further two goals from Hughes and a tap in from Caolian Coyle saw the visitors go into the break with a 5 – 2 advantage. Newry started the second half brightly in an attempt to salvage some pride after the late collapse in the first. TJ Hughes made it 5-3 when he rifled home from the edge of the area after a clever knock back from Keith Johnston in the 50th minute. Two minutes later it was 5-4 when Johnston saw his effort go in off the post to complete his hat-trick. Speaking to newrycityafc.co.uk after the match, Newry Reserves boss Ronan Casey was less than enamoured with his side’s display. Next up for Casey’s men is successive away trips to Linfield and Glentoran in the next 10 days. 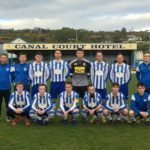 Newry City Reserves welcomed Glenavon Reserves to the Showgrounds on Halloween night in the hope of continuing their recent good league form. Still without the injured Shealan Fegan and suspended Mark McCullough, the home side were happy to welcome back Leigh Crooks from his month long ankle injury and were bolstered by the addition of Tiernan O’Reilly and Tiarnan Murphy who have been performing well in Newry’s Mid Ulster League U19 team in recent weeks. The game got off to the worst possible start for the hosts when Glenavon midfielder Ross Hunter skipped past a few challenges on the edge of the area in the second minute, before being upended by a Newry defender. Referee Ryan Hanna had no choice but to point to the spot. The resulting penalty was cooling dispatched by captain Lewis Parker. Newry’s response was nearly immediate though and in the fifth minute the sides were level. TJ Hughes’ through ball was chased down by Soki John, who found himself in a foot race with keeper Marc Davidson. 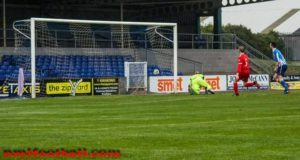 Although the Glenavon stopper was able to clear at the edge of the box, his clearance only found Josh Durnin 40 yards from goal and his brilliant first time left footed effort beat the stranded keeper who couldn’t get back in time. This seemed to settle the Newry side down and they were able to build up a head of steam over the next 20 minute period which saw a further two goals. Firstly, Lee Hutchison sent a wonderful cross into the box from the right wing on 15 minutes towards the onrushing TJ Hughes who was poleaxed by the onrushing keeper. Durnin’s low drive to the keeper’s left from penalty spot made it 2-1 to the home side. On 25 minutes, it was 3-1, when a wonderful 5 man move through midfield saw wide man Ryan Duffy expertly volley home from the edge of the area for his first of the season. As half time approached, Newry had further opportunities when TJ Hughes had two chances cleared off the line and Lee Hutchinson blazed over from 6 yards with the goal at his mercy. Newry could have put the game firmly to bed at the start of the second half, with 3 good chances in the first 5 minutes from Soki John, Josh Durnin and TJ Hughes, but keeper Davisdon was equal to them all. After that, it was Glenavon for the most part who did their best to claw their way back into the game, whilst Newry seemed content to try and see the game out. 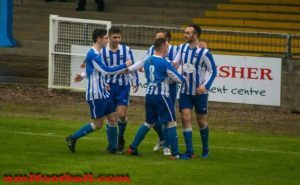 Chances were few and far between for both sides although the game made for a nervy finish when Harry Evans scored in the 80th minute to reduce the deficit to one. The dismissal of TJ Hughes for a second yellow in the closing moments didn’t help Newry’s cause. But some resolute defending from Annett, Crooks, McGreevey and Mackey saw the home side see out a hard fought victory and move to 4th in the Premiership Development table. 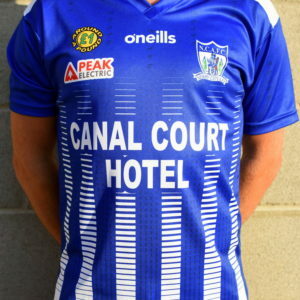 “That was a good three points tonight as we were far from our best,” said Newry Reserves’ manager Ronan Casey. “At times, we looked very lethargic and on another night we could have been punished for that. “Since the last game, we’ve been a bit ‘stop start’ in terms of training with men missing for various reasons. Sometimes these things can’t be helped but it was crystal clear tonight, we can’t afford to take our foot off the gas or stop working hard. They were right in our faces and were extremely busy. At times we really struggled to get to grips with them. That said, we came out on the right side of the result which is the main thing. “It was also great to see some of the promising U19s involved tonight. Tiarnan Murphy came on for the last 20 minutes and was excellent. He has only turned 16 but really impressed with his direct running and certainly didn’t look out of place. There is some really good underage talent at this club and as long as they keep working hard, opportunities will present themselves,” added Casey. The Reserves are next in action on Wednesday (November 7) to take on Crusaders Reserves at Seaview, kicking off at 7:45pm. Photo courtesy of Sean Donegan Photography. 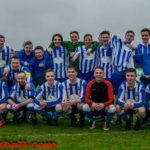 Roared on by an enthusiastic support at The Showgrounds the City lads came from behind to win this enthralling encounter and at the same time bagged the MUFL Reserve Championship Title. A strong Coagh side took the lead in the 8th minute with a great strike that gave home keeper Marty Marron absolutely no chance. Three minutes later the visitors were awarded a penalty but Marty Marron made a superb save to keep the homesters in the game. City retaliated and in the 14th minute Marcus McKeown accepted a Jordan King pass to slip in a deserved equaliser. McKeown was looking dangerous in an unfamiliar striking role for City and he came close again but keeper William Hassen saved well for Coagh. Paulius Smaryginas smashed in a great 30 yarder to put Newry in front at the 20 min mark. City with Chris McMahon, Josh Durnin and Ryan Quinn all in top form dominated the midfield exchanges as half time was reached. Goal Scorers: Paulis Smaryginas, Marcus McKeown, Chris McMahon. Photo courtesy of Sean Donegan Photography. 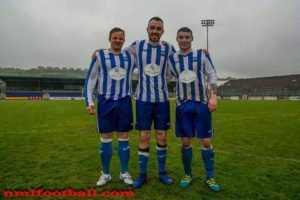 Minutes after the resumption Marcus McKeown put Newry further ahead with a clever finish and in the 68th minute Chris McMahon blasted in a penalty to put Newry 4-1 up. Although Coagh came back strongly to reduce the arrears the City lads were totally focused and determined to finish as winners and took the title in style amidst jubilant scenes at the finish. 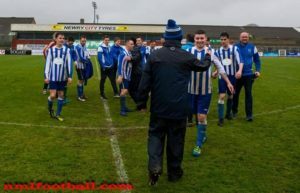 Newry City Reserve Manager, Gary Redpath commented “This was a fantastic day for the club, we won every home league game this season but the last three league games have shown me how far this group have grown individually and collectively. 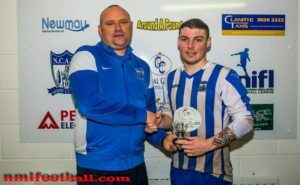 Newry City Reserve Captain, Ryan Quinn “It feels so good to say that we won the league, we have played well all season and I believe it was fully deserved. The other thing is Gary and the boys have us playing passing football, so every game has been really enjoyable. Anyone who has been at our games have been entertained. It’s a great achievement for such a young squad with the average age of 20, I hope that winning the league will help show people that there are good young local lads coming through for Newry. Hopefully now the first team can play to their best in the play offs next week and bring more success to the club, I wish them the best of luck. MOTM Chris McMahon. Photo courtesy of Sean Donegan Photography. Newry Manager Darren Mullen “I’m delighted for Gary and the rest of the lads involved with the reserve team as I know how much time and effort they put into it. 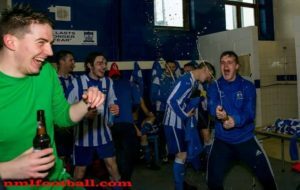 To win a league title at any level is never easy but they have won it playing some very good football and those young lads will be all the better for this experience. 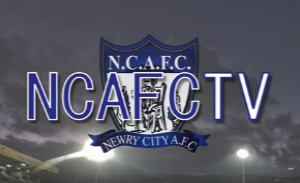 Newry City AFC Res — Marty Marron, Jordan Coyle, Jordan King, Gerard Mooney, Lee Courtney, Chris McMcMahon, Josh Durnin, Ryan Quinn, Marcus McKeown, Paulius Smaryginas, Cian Feehan. 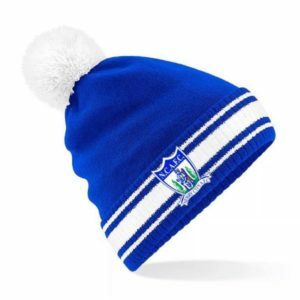 Subs– Brian Hobden, Shealan Fegan, Gavin Conn, Ian Curran, and Jack Heaney. Coagh United Res — William Hassen, Matthew Sloan, Alvin Ferso, Alex Lees, Tim Grahame, Mark Stewart, Stefan Hogshaw, Jamie Tumilty, Daniel McKinless, Stefan Thompson and Robert Allen. 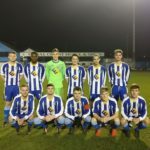 Newry City Reserves kept alive their hopes of the Mid Ulster Reserve League title with a hard fought 2-1 win on Wednesday evening at home to Valley Rangers Reserves. A game which started off slowly burst into life after 25 minutes, Newry’s Jordan King pushing forward from left back before swapping passes with Sean McMullan and drilling a shot from 30 yards which the Valley keeper William Charleton did well to tip onto the post. In a strange twist, seconds later play immediately swung to the other end, Valleys Robert McCullough making room for himself on the left wing before he also tried his luck from distance, also unfortunate to see his shot smack the upright. The home side were gradually getting on top and almost broke the deadlock on the half hour mark, dead ball specialist Paulis Smaryginas hitting a free kick from 35 yards which swerved and dipped on its way to goal, Charleton producing a fine save pushing the ball over his cross bar for a corner. The danger however hadn’t passed, Quinns corner falling to Chris McMahon who had two efforts on goal blocked before the ball was scrambled clear. With 40 minutes on the clock and somewhat against the run of play Valley grabbed the opening goal, Jonathon McMath beating Marty Marron with a low shot from the edge of the box. The lead however was not to last until half time, McMahon pitching a free kick into the feet of centre forward McMullan, the big man completely losing his marker with a Cryuff turn before laying the ball across the face of goal giving Neil Mullen the simple task of placing the ball past Charleton to leave the score level at the break. The home side were almost caught cold in the early moments of the second half. With a free kick in the centre circle Valleys Andrew McCoy spotted the chance to take the Newry defence out of the game with a long free kick into the path of McMath who looked sure to score only for a superb sliding block from Mullen. The home side made the most of this reprieve on 50 minutes when King again strode forward, his run taking him inside the Valley penalty area where he was halted by a cynical trip, referee McArdle pointing straight to the penalty spot. With penalty king McMullan stepping up to the spot kick there was only going to be one result, McMullan placing the ball inside the post out of the reach off Charleton for what turned out to be the winning goal. There was however still a lot of football to be played, Valley who held an outside chance to win the league giving their all to get back into the game but were unable to break a stubborn Newry defence in which the central pair of Gerard Mooney and Neil Mullen stood out. And with the visitors committed to getting back in the game it was obvious that gaps would appear for Newry to close out the game, in the closing moments both McMullan and Thomas McCann passing on chances to seal the win but fortunately for the home side it mattered not as time ran out for a Valley comeback, referee McArdle calling time with Newry leading 2-1. 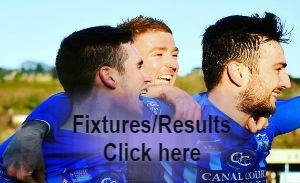 Newry Reserves final game of the season is scheduled for Saturday 22nd April at home to Coagh kick off 2:15pm. 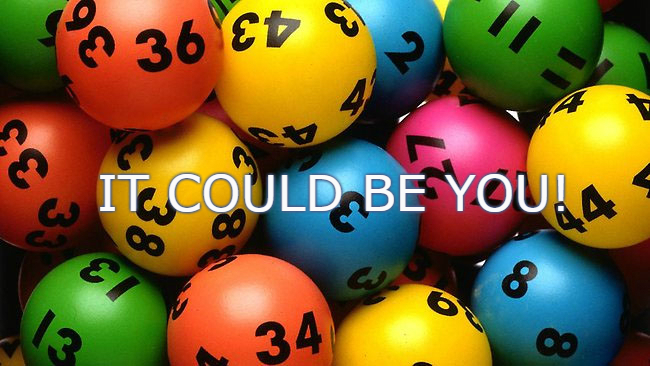 Newry Team: Marty Marron, Jordan Coyle, Jordan King, Gerard Mooney, Neil Mullen, Chris McMahon, Josh Durnin, Ryan Quinn, Sean McMullan, Paulis Smaryginas, Thomas McCann. Subs: Marcus McKeown, Cian Feehan, Shealan Fegan, Gavin Conn, Brian Hobden.